The Club’s end-of-year Dinner Dance 2017 is just around the corner now, taking place on Saturday 2nd December in The Roe Park Resort, Limavady. We extend an invite to all friends of St Canice’s GAC: members, their families & friends, and our fellow-gaels from across our neighbouring hurling, camogie and ladies’ football clubs. 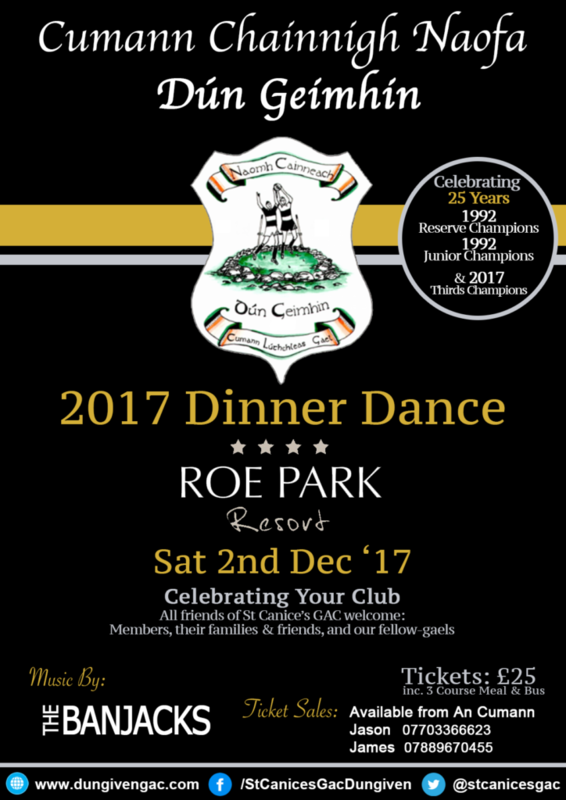 This will be a non-profit event and is aimed at bringing all of our club friends together for a night of good food and great craic. Tickets (to include 4-course meal, music by the The Banjacks, and a free bus to/from venue) are priced at £25 and are available through the Club Bar, or by contacting Jason Craig, James McMacken or Martin Heaney. Numbers will be limited so please get your tickets asap. Tickets are on sale from today, and numbers will be limited so please get your tickets asap.